Unclaimed Persons is a group of volunteer genealogists who donate their time and research skills to assist medical examiners, coroners and investigators to locate the next of kin of deceased individuals whose relatives have proven difficult to identify and trace. The group is a spontaneous outgrowth of a show of the same name on RootsTelevision.com that features a genealogist helping coroners' offices. The show sparked a wave of volunteers to offer their services and resulted in the Unclaimed Persons community that now numbers more than 350 volunteers. Please visit our Facebook Community to 'meet' more of the Unclaimed Persons team. WHAT'S THE DIFFERENCE BETWEEN UNCLAIMEDPERSONS.COM AND UNCLAIMEDPERSONS.ORG? UnclaimedPersons.com is the State of California Unclaimed Persons Database Search, created and maintained by the San Bernardino County Sheriff-Coroner Division. UnclaimedPersons.org is a group of volunteers who work to assist San Bernardino and other counties across the country with such cases. While the volunteer group greatly admires and was partially inspired by San Bernardino's database, there is no formal relationship between the two entities. Unclaimed Persons receives cases from medical examiners, coroners or investigators. The cases are given to case managers, who assign individual cases to case administrators. Administrators post each case, notify researchers and oversee the research effort. Researchers use their sleuthing skills to find all the information they can on the decedents' families without making any contact. 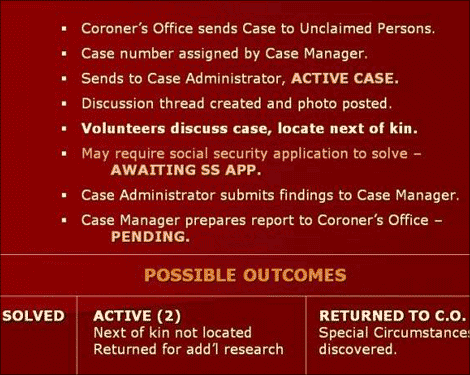 When enough information is believed to have been found, the case administrator sends the findings to a case manager, who reviews the research, writes a report, and submits it to the requesting organization. Case outcome and feedback information is later shared with the researchers once it is received from the sponsoring agency. In a "help us help you" attempt, we have created a Request for Assistance Submission form for medical examiners, coroners and investigators, although they are free to submit cases in other ways. Usually, and we strongly encourage this. Most offices are kind enough to tell us the outcome of each case, although the amount of detail varies widely. We like to share what we can (without invading anyone's privacy) because it's very motivating to learn the results of one's research efforts. Having said that, we do not receive feedback on every single case, which is why some remain in pending status for a long time or are eventually shifted to closed status. While it is not common, cases can be returned for a second attempt. It may be that the contact information provided has not panned out or that the relative(s) contacted has refused to cooperate. This is why we stress the importance of being as certain as possible as we can of all details provided, and trying our best to submit information for several relatives and associates of the deceased to the submitting agency. This way, if one family member does not work out, another may. There is no pat answer because it varies from county to county. In many cases, the deceased will have already been cremated and/or buried. In others, the next of kin will have the option to make those decisions. If the deceased has already been cremated/buried, the family members usually have the option to disinter, but there are some counties that scatter ashes at sea or use other such procedures that may prevent this. It should also be mentioned that many counties will make the appropriate arrangements if they are able to determine that the deceased was a Veteran, and have them interred in National Cemeteries. DO MEDICAL EXAMINERS, CORONERS AND INVESTIGATORS DO DNA TESTING ON THE DECEDENTS? This is specific to each county; some do and some don't. Even those that do wouldn't necessarily realize that genealogists would have any clue how to use DNA for identification purposes. Also, most probably rely primarily or exclusively on CODIS testing rather than the Y-DNA and mtDNA tests that genealogists are more accustomed to working with. To date, we only know of one of our cases having involved DNA testing, but that could change in the future. At this point, we're dealing primarily with U.S.-based cases (although several of our cases have involved foreign-born individuals), but that's mainly because those are the ones who have contacted us so far. Moving forward, we're more than open to working international cases. Click here or any of the Unclaimed Persons Facebook group links on this site. If you're not already registered with Facebook, you'll need to (it's free). Then we suggest that you explore the photo area where cases are posted, the wall where comments are made, and especially the case-specific discussion boards. Please also review the guidelines before participating in an actual case. WHAT ARE THE UNCLAIMED PERSONS CASE GUIDELINES? Since volunteers can't actually contact relatives to confirm addresses and phone numbers, it's a good idea to include all contact details that you find and mention which one you think might be most likely. Also, because we've become such a mobile society, it's best to include information for several relatives, and the various addresses that are associated with them. This gives the submitting agencies alternatives to work with in case the contact information for one person doesn't pan out. This also keeps the back-and-forthing between the submitting agency and Unclaimed Persons to a minimum so we both can do our respective work. WHERE DO I POST TO THE CASES? Each case is numbered and has its own discussion board in the Unclaimed Persons group on Facebook. Please post your findings here so that others may build on your discoveries and move the case forward. If, however, you have private information about living persons, such as likely next of kin, please not post this. Rather, send it directly and privately to the Case Administrator (just look for the person who initially posted the case, click on their name above their post, and then click on "send message"). DO YOU HAVE TO BE A GENEALOGIST TO PARTICIPATE? No, but it helps! Medical examiners, coroners or investigators typically have access to information that others don't - for instance, some police-related databases. What seems to make genealogists useful is our knowledge of less obvious resources that can round out the family information already available to submitting agencies. But anyone with an interest is welcome to join. Those who are new to such research may wish to join and monitor some cases to get a better feel for our techniques and favorite resources before actually participating. SHOULD I POST SOMETHING EVEN IF I DON'T THINK IT'S IMPORTANT? Sometimes a clue that doesn't initially seem important will be the one that someone else will pick up and run with. This is one of the reasons this Unclaimed Persons group was created and is perhaps one of its greatest strengths. So yes, post away! WHY DO WE HAVE TO CODE THE NAMES AND PERSONAL INFORMATION OF THE LIVING? In an effort to protect the privacy of living individuals, we stress coding the names and personal information. If you need that information to continue your research, simply contact that person privately by clicking on their name above their post, then clicking on "send message." HOW DOES A CASE ADMINISTRATOR KNOW WHAT THE CODED WORDS SAY? When posting coded information, the researcher should send the uncoded version to the Case Administrator (the person who initially posted the case and sent out the "call"). If that step is overlooked, and the Administrator thinks it is important, they will ask for the information to be sent to them. CAN WE E-MAIL THE CASE ADMINISTRATORS? The case administrators and case managers are always happy to answer questions. If you have any questions that don't pertain to a specific case, please ask them "off board" so that unrelated chatter is kept to a minimum. This makes it easier for researchers to follow the flow of the case. HOW CAN I FIND OUT THE STATUS OF THE CASES? There are two ways to find the status of the cases. One is to go to the "Case Status Update" board; the other is to go to the photo section where you will find the cases as images, all stamped with their status (e.g., pending, solved, awaiting SS application, etc.). Pending means that a report for a researched case has been sent to the submitting agency and we are waiting for them to contact family members. If the family is located, the case if shifted into "Solved" status. If the family is not found with the information that we have provided, then the case is returned to us, and we try another path. WHY DON'T YOU CREATE MORE THAN ONE PHOTO ALBUM TO KEEP THE ACTIVE, PENDING, AWAITING SS APPS, AND SOLVED CASES SEPARATE? Though a good idea, the group account in Facebook unfortunately doesn't allow us to create more than one photo album. This is why we stamp the cases with their status in the photo section. WHO NOTIFIES THE DECEDENT'S FAMILY? The medical examiner, coroner or investigator who submitted the case notifies the decedent's family. Unclaimed Persons volunteers never make contact with family members. WHAT DOES "WAITING FOR SS APP" MEAN? It means that we have ordered a Social Security application for the deceased and are waiting for the document to be received (typically, 6-10 weeks). We occasionally do this for cases that prove challenging. It is up to volunteers whether they choose to continue to "work" the case while we are waiting for the application. WHY DO YOU ORDER SOCIAL SECURITY APPLICATIONS? We do this on occasion for cases that are proving stubborn. Social Security applications usually include name of parents, information that's often useful in moving a case forward. In most cases, though, the submitting agency has already supplied this information or we are able to locate family members without it. DO MEDICAL EXAMINERS, CORONERS AND INVESTIGATORS CHECK WITH THE SOCIAL SECURITY ADMINISTRATION AND ASK FOR NAMES OF THE PARENTS? This varies from county to county. In some cases when parents' names have not been provided and our volunteers have exhausted the usual resources, we will request the Social Security application of the deceased to try to learn the parents' names. In other cases, we will work to coordinate with the submitting agency to make this request.